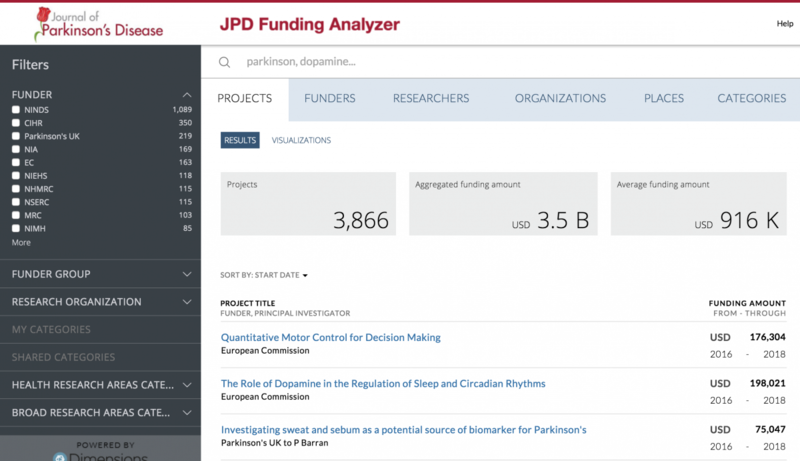 The Journal of Parkinson’s Disease (JPD) is proud to announce the launch of the Parkinson’s Disease Funding Analyzer (PDFA) on the JPD website. It is a free service that is part of a new suite of online features that have been designed to serve the needs of the Parkinson’s disease (PD) research community. PDFA presents in-depth data on 114 funders from 40 countries including all of the European Union, Australia, Canada, Ireland, Qatar, the United Kingdom, and the United States. Working with development partner ÜberResearch, a solutions and services company focused on the specific needs of science funders, PDFA includes all funding related to PD drawn from ÜberResearch’s extensive grant database of more than $940 billion of funded research, representing more than 2 million projects from 200 funders like the National Institutes of Health and the National Science Foundation in the U.S. and the Wellcome Trust and U.K. Research Councils in the U.K.
PDFA allows users to easily locate funding related to PD and analyze funding streams and trends. Further, it facilitates a better understanding of research organizations’ funding portfolios and the funding patterns of specific funders, both of which are critical when developing grant applications. For example, users can conduct line-of-investigation queries (e.g., alpha-synuclein, L-Dopa, transplantation) to look for funding trends and to see which investigators in which countries have been the most successful in obtaining funding in a given area of PD research. New funding information will be added to the PDFA on an ongoing basis. “We invite all PD researchers to register at www.journalofparkinsonsdisease.com/funding for this valuable service, which we are pleased to make available at no charge,” added Dr. Brundin. Registration not only enbles users to access the PDFA, but also use other features on the site.